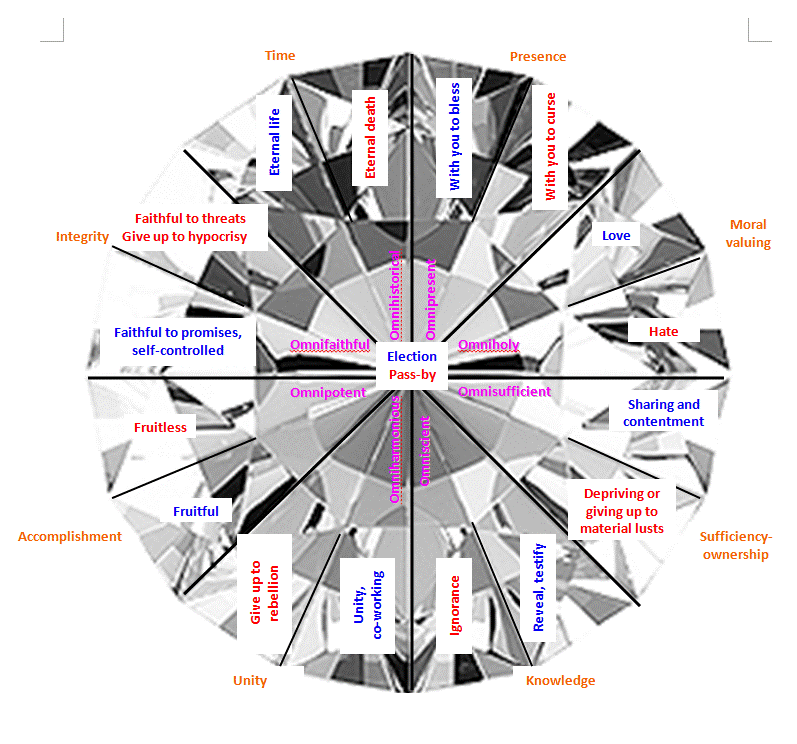 We have used the three traditional omni-attributes of God (omnipresent, omniscient, omnipotent) and adapted this nomenclature to five additional attributes that have traditional definitions (omniholy, omnisufficient, omniharmonious, omnifaithful, omnihistorical) using a jewel illustration to show relationships between internal facets (original omni-attributes) and external facets (reflective attributes) to help believers understand connections between who God is and Christ's likeness. The same "omni" prefixes on God's original attributes and the orange topical categories helps the reader to develop a more unified vocabulary as well as enabling a paradigm shift to consider more likeness parallels. Traditional attribute names and categorizations tend to isolate incommunicable attributes from any Christian likeness applications, concealing the whole nature of God from his full reflective likeness in Christ's human nature and Christians. As we consider God's attributes in relation to the covenantal stance of God expressed in the Westminster Standards, we can extrapolate ways that each omni-attribute is reflected in variable ways. He turns his blessed face the elect, meaning all his omni-attributes are turned to bless those He loves in Christ. He turns his cursed face to those He passes meaning all his omni-attributes are turned to curse those he hates who are under his eternal wrath. The jewel illustration below shows the original attributes of God as the pink omni-attributes in the center, with variable reflections of blue to the elect and red to those God passes by and leaves in their sins. Each category of attributes is labeled with an orange summary topic that logically relates to the set of attributes. Of course we do not know God's absolute decree to elect or pass by except by current evidences of faith, repentance, hope and love. Yet as we better know the God who reflects his full self in election and reprobation, we see many ways Scriptural commands us to reflect both faces in this world. Another perplexing problem that this model seeks to resolve is the relationship between the attributes of God and the moral law, the standard of righteousness. The Westminster Larger Catechism Q&A 99-150 offers a thorough biblical theology of the Ten Commandments, in their inner spiritual transformation as well as their visible moral duties. This project compares the eight omni-attributes, with blessed and cursed face reflections, with these moral law themes and finds another integrating paradigm for understanding the doctrine of Christ's righteousness, the meaning of the curse on the cross, the proof of his righteousness by his resurrection, the power of the Word and Spirit to write the law on the heart and enable obedience to these standards of the righteous Christian life. We will see the the fruits of the Spirit list in Galatians 5:22-23 is not the complete list of required spiritual qualities. Since God's nature has both blessed and cursed faces, we will need love and hatred, joy and grief, peace and conflict, patience and zeal, kindness and severity, goodness and justice, faithfulness to bless and faithfulness to cast out, gentleness and resistance of evil, self-control and executing judgment. The Reformed publishing market has many wonderful books and resources for both our doctrinal foundations (systematic and biblical theology) and our life applications (biblical counseling, marketplace ministry, family life, church, personal spirituality). Yet few books are trying to present the big picture of the doctrinal foundations connected with the meta-application contexts of the Christian life. The publishing market has tended to separate the doctrinal treatises from the practical story-telling Christian life books. Unveiled Faces Reformed Press is committed to a publishing revolution that seeks to integrate the doctrine of God's attributes with all the other categories of doctrine and Christian life practice. We start with expansive categories for the attributes of God, show how they are perfectly reflected in Christ's human nature, imputed in justification, imparted in sanctification and perfected in glorification. Likeness to Christ also has offices (prophet, priest, king) realms (earthly and heavenly) and places (assembly, creation and diaspora). After these meta-categories are established, we can get specific with the variety of our various gifts and callings, examples and stories. As a result, we will discover irreducible complexities of Christian maturity that reflect the complexity of all God's attributes.